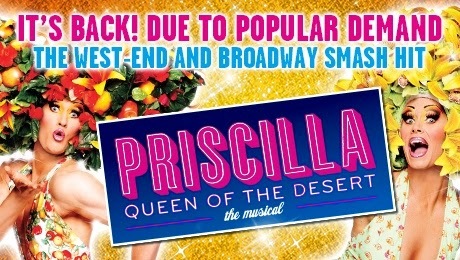 The full cast of the international smash hit musical PRISCILLA QUEEN OF THE DESERT coming to the King’s Theatre Glasgow from Tuesday 29 March until Saturday 2 April 2016 has been confirmed! Joining the previously announced Duncan James as ‘Tick’, are Simon Green as ‘Bernadette’, Adam Bailey as ‘Felicia’ and Philip Childs as ‘Bob’. Simon Green’s most recent stage credits include ‘Bruce Ismay’ in “Titanic” both in Toronto and at the Southwark Playhouse; “The World Goes Round” at the Union Theatre and ‘Monsieur André’ in “The Phantom of The Opera” on tour. Adam Bailey most recently appeared as ‘Espresso’ in the German production of “Starlight Express”. His other theatre credits include ‘Mary Sunshine’ in “Chicago” at Leicester Curve and ‘Alan’ in “Bare” at the Greenwich Theatre. Philip Childs played the role of ‘Bob’ on the 2013 tour of “Priscilla Queen of the Desert”. He is currently appearing as ‘Doctor Dillamond’ in “Wicked” at the Apollo Victoria. Other recent theatre credits include Alan Bennett’s “People” and “The Habit of Art” at the National Theatre. As one quarter of the pop band Blue, Duncan James has sold over 16 million records, had three number one albums and forty number one singles worldwide. His stage credits include playing ‘Warner Huntington III’ in the West End production of “Legally Blonde” and ‘Billy Flynn’ in “Chicago”. He was also a finalist on ITV1’s Dancing on Ice. They are joined by: Richard Astbury; Rebecca Botterill; Matt Crandon; Peter Cumins; Amy Di Bartolomeo; Martin Harding; Lisa-Marie Holmes; Ricky Lee Loftus; Adam Lyons; Callum MacDonald; Laura Mansell; Catherine Mort; James Paul McAllister; Robin Mills; Craig Ryder; Naomi Slights and Julie Yammanee. Get ready for the ride of your life! Based on the movie, PRISCILLA QUEEN OF THE DESERT THE MUSICAL is the heart-warming, uplifting adventure of three friends who hop aboard a battered old bus searching for love and friendship and end up finding more than they could have ever dreamed of. 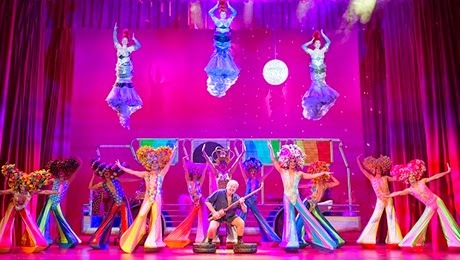 With a dazzling array of outrageous costumes and a hit parade of dancefloor classics including ‘I Will Survive’, ‘Say a Little Prayer’, ‘Go West’, ‘Hot Stuff’, Boogie Wonderland’ and ‘Always on My Mind’, this wildly fresh and funny new musical is a journey to the heart of FABULOUS!